SNIPPITS AND SNAPPITS: GREECE IS NOT POOR ~ IT ACTUALLY HAS MASSIVE UNTAPPED RESERVES OF GOLD, OIL, AND NATURAL GAS! GREECE IS NOT POOR ~ IT ACTUALLY HAS MASSIVE UNTAPPED RESERVES OF GOLD, OIL, AND NATURAL GAS! ED Noor: This is Rothschild imperialism being imposed on GREECE! It would not surprise me in the least if we found out that the bankers have known about these reserves for quite some time and their attempts to bankrupt and destroy this nation were part of a preplanned takeover scheme. For the longest times the LIARS in the mainstream media have talked about the "plight" of Greece and how that "poor" nation must accept criminal Jewish Rothschild "austerity" measures to save itself from economic disaster. I have long called on the Greek people to never accept these criminal measures, because it will mean perpetual debt enslavement to these criminals! It turns out that the poster child for the European debt crisis is not actually poor at all. In fact, the truth is that the nation of Greece is sitting on absolutely massive untapped reserves of gold, oil and natural gas. If the Greeks were to fully exploit the natural resources that are literally right under their feet, they would no longer have any debt problems. Fortunately, this recent economic crisis has spurred them to action and it is now being projected that Greece will be the number one gold producer in Europe by 2016. In addition, Greece is now opening up exploration of their massive oil and natural gas deposits. Reportedly, Greece is sitting on hundreds of millions of barrels of oil and gigantic natural gas deposits that are worth trillions of dollars. It is truly sad that Greece should be one of the wealthiest nations in all of Europe but instead the country is going through the worst economic depression that it has experienced in modern history. It is kind of like a homeless man that sleeps on the streets every night without realizing that a relative has left him an inheritance worth millions of dollars. Greece is not poor at all, and hopefully the people of Greece can learn the truth about all of this wealth and chart a course out of this current mess. I have written extensively about the nightmarish economic conditions that Greece is experiencing right now. Just check out this article, this article and this article. 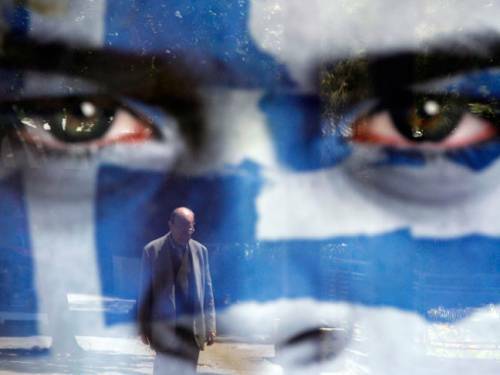 Since the depression began in Greece, the Greek economy has contracted by more than 20 percent. In April 2010, the unemployment rate in Greece was only 11.8 percent. Since then it has skyrocketed to 25.1 percent. According to Bloomberg, there is a massive amount of gold in Greece. This recent economic crisis has accelerated the approval of mining activity, and it is now being projected that Greece will soon be the number one gold producing country in all of Europe. But Greece doesn't just have gold. Greece is also swimming in oil and natural gas. It turns out that Greece is sitting on the western edge of an absolutely mammoth sub-Mediterranean oil and gas field, and there are also huge deposits of oil and natural gas in the western parts of the country. A Reuters article back in July discussed how foreign firms are now rushing to exploit these tremendous resources. The numbers that are being reported so far are staggering. The following comes from a Greek news source. Until now the offers for hydrocarbon exploration have concerned three blocks: The first is in the Gulf of Patra, the second off the coast of Katakolo ~ both in Western Greece ~ and the third at Ioannina, northwestern Greece. 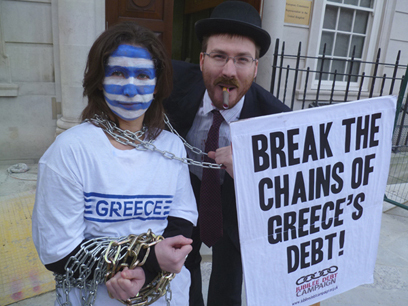 The truth is that Greece has enough oil and natural gas to be able to pay off all of their debts. The value of the natural gas that they are sitting on alone has been estimated to be worth trillions of dollars. The following is from an article earlier this year by F. William Engdahl. In December 2010, as it seemed the Greek crisis might still be resolved without the by-now huge bailouts or privatizations, Greece’s Energy Ministry formed a special group of experts to research the prospects for oil and gas in Greek waters. Greece’s Energean Oil & Gas began increased investment into drilling in the offshore waters after a successful smaller oil discovery in 2009. Major geological surveys were made. Even if only a fraction of that is available, it would transform the finances of Greece and the entire region. So unlike several other nations in Europe, things actually look quite promising for Greece in the years ahead if they manage their resources correctly and don't let foreigners come in and steal all of their wealth. NTS Notes; As I stated in the header for this article... Sometimes the REAL truth does leak out! through their phony debt based monetary system. for their own greed and profit. What a sweet deal indeed! This is something that the proud people of Greece must be made aware of immediately. They must definitely reject all austerity measures and if necessary throw out their criminal government which supports the criminal Rothschild's debt measures and go the way that Iceland has gone. The Greek people must tell these criminals to take their austerity and shove it where the sun does not shine! And if these criminals are lying about Greece..
Then what about the other nations of the fraudulent European Union that they claim are in "economic trouble"? It is definitely time for the people of Europe, and everywhere else, to wake the hell up and end the scourge of Jewish criminal Usury banking once and for all time. I appreciate your brave attempt to show the possibilities of Greece, but allow me to say that it is done in a very naive manner since the fact that the Greek people are NOT in power at this moment is ignored. Did you ask anyone of us whether we know about this or not? 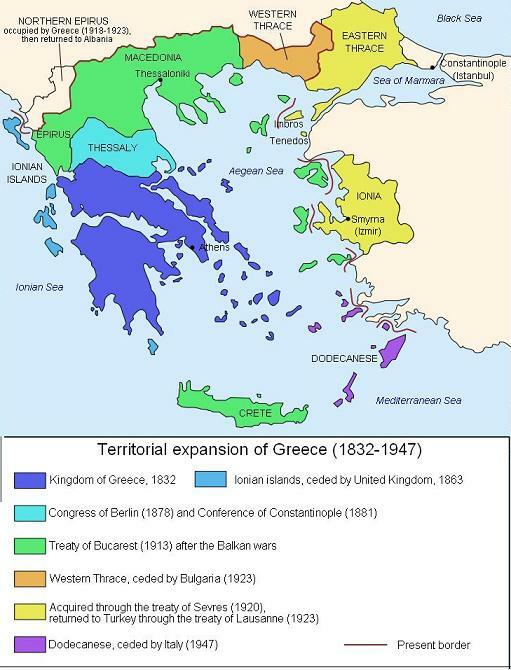 We have known about these resources for decades and we also know that this is why FYROM (Skopje) is so keen on calling itself Macedonia (to claim parts of Greece exactly where the gold and silver is), why Turkey wants to put its foot in Thrace (same reason as FYROM), why Albania claim land from Greece and why the AOZ between Turkey and Greece (sea borders) has not yet been determined. We know that this is the main reason behind the Greek entrance in the Eurozone in 2002 (and why Goldman Sachs helped the Greek ministry of finance to ‘fix’ the figures). We have seen the shadows of the vultures flying over our nation for a long time now, and it’s rather offending of you to suggest that we are like ‘a homeless man’ who doesn’t know about his inherited wealth. Why don’t you question the ethos of the ‘robbing man’ and the ‘lying man’ who caused the ‘homeless man’ his homelessness? If you don’t ask us first, you might awake suspicions that you assume ignorance from our side based on the well known ‘colonial’ ethos that so often the bought academia is adopting. The ‘colonial’ ethos is the one that doesn’t at all consider the people who inhabit the land in their calculations. Why don’t you also clarify in this article, that the people of Greece are NOT controlling the decisions today but a bunch of oligarchs? Why don’t you explain that it is a highly infected political scene determining Greece’s future at this moment with no consideration of the best for the people and the country of Greece? We know about this because the Greek police frequently arrest protesters who protest where the gold and silver is going to be mined (by foreign companies). The last time this was done was yesterday 21-10-2012. Why do you think that Greece has been under such an obvious, first of all social, cultural and political attack since the mid-70′s from the super powers, then a financial attack since the mid-90′s by the EU and the central banks? To compare Greece with a ‘homeless man’ that does not know that he have a lot of money is a ridiculous allegory, simply because it is very wrong since this homeless guy KNOWS VERY WELL who put him on the streets and since then are trying to take over the rights of his wealth! Greece is NOT opening up their exploitation of their resources now, THE CORRUPT BUSINESSMEN AND POLITICIANS ARE INSTEAD BARGAINING WITH OUR PUBLIC WEALTH FOR PEANUTS WITH THE FOREIGN LOAN SHARKS. Maybe you are not so familiar with what the first and second, undemocratically and unconstitutionally imposed “memorandum” says in clear text in its 700 pages. 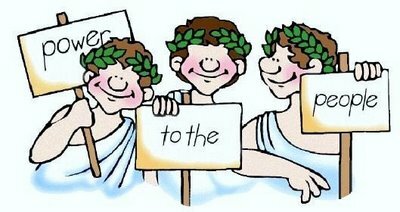 It takes from the Greek people, the Greek public, the rights to claim or demand anything out of this wealth unless the ‘lenders’ are paid first. Never mind that 80% of those loans didn’t go to the public at all, but to private bank accounts and untaxed too! Unless these assets lays in the hands of the Greek people, the future is not at all that bright for the Greek people Mr. Snyder, because the same corrupt forces that has put Greece in its current situation will rob it’s “newly” discovered wealth too. Only if these resources will be controlled by the Greek people and ONLY the Greek people, can this truly benefit us. Otherwise this will go the same way as all the previous wealth that superpowers robbed from Greece before (Prussia, Italy, Russia, France, Germany, UK and USA since 1824)! Mr. Snyder if you want to analyze the future of the Greeks and what’s the best for us in an adequate way, learn our modern history properly first and see who always stole our wealth and put our country in proper catastrophes. OUR PROBLEM IN HISTORY HAS NEVER BEEN TO DISCOVER THINGS OR UNDERSTAND THINGS IN THEIR ESSENCE, NO! ~ OUR PROBLEM HAS ALWAYS BEEN ‘THIEVES’ AND ‘KILLERS’ WHO WANTED OUR WEALTH AND OUR LAND! It is not us who hold the culture of piracy, theft and genocides on a pedestal, for imperial profit and gain of power.